Bloons Tower Defense 5 is a great tower defense game that you can play with friends or strangers. We play this everyday and still have fun. 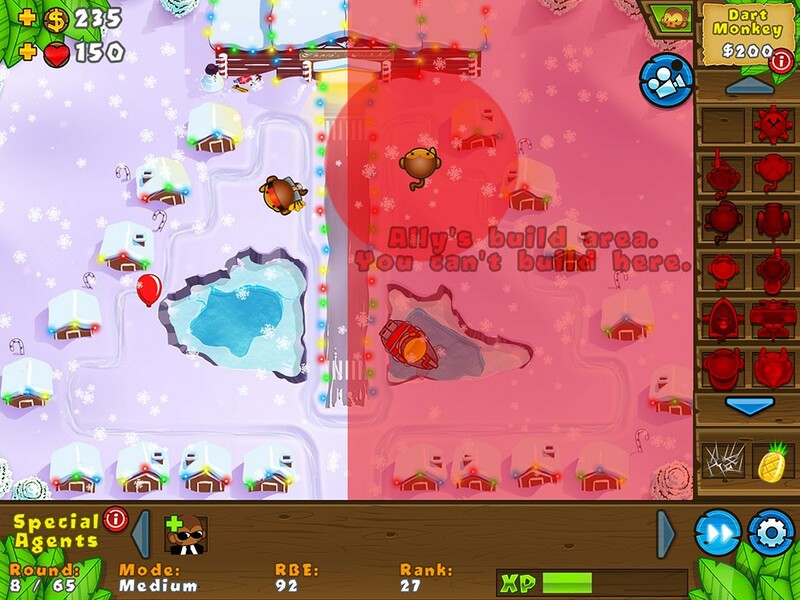 Bloons TD 5 makes co-op matchups easy. In quick play mode, you choose the difficulty of the game and it can immediately match you with another player. If you want to play with a specific person, you both need to have different Facebook or Game Center accounts. The towers of Bloons TD 5 are very unique. Many towers are monkeys throwing darts, boomerangs, and even using magic. Other towers are like banana farms that give you more money or missile launchers with shark looking missiles. Another part of the game is earning experience that upgrades your towers. The more you play of the game, the more towers you unlock. Also, the more you play with specific towers, the more upgrades you can get for those towers. Each tower has two upgrade paths with four upgrades each. Winning co-op games against the computer can earn you in game money that you can use on overall upgrades for your towers. In the monkey city, there is a monkey lab where you can spend your money on upgrades that will affect all of your towers. Some upgrades include faster firing, stronger towers, and increase in the amount of coins you start with in a game. Bloons TD 5 is a fun game that we can easily enjoy. If you want to play against players instead of co-op, download Bloons TD Battles. This entry was posted and tagged 2-player co-op, Bloons TD 5, Gamecenter, What We're Playing on February 7, 2016 by admin. The world’s most exciting hunting action game, Monster Hunter Freedom Unite, is now available for iOS! Whether you’re a rookie or veteran hunter, intuitive touch controls will help you tackle the biggest, baddest monsters out there. Let the hunt begin! There are so many ways to progress through Monster Hunter Freedom Unite for iOS. With a multitude of quests to complete, you can choose to tackle something new, or go back and replay a quest you’ve already cleared with new weapons and tactics. How you play the game is really up to you! You’ll embark on quests with numerous objectives, from gathering items to slaying monsters. If you’re successful, you’ll reap the spoils, which you can use to create and enhance weapons and armor. Once you’ve buffed up your character, you’ll be ready to take on even bigger quests! The controls have been designed so you can intuitively perform complicated actions at the touch of a button! A number of functions are included to assist you while you hunt, such as the ‘target camera,’ which keeps monsters in your sights, and the ‘pop-up icon,’ which indicates things you can interact with. 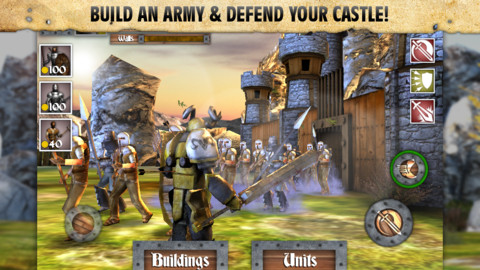 The game’s graphics have been optimized for iOS devices. Just wait until you see all of the beautiful environments for you to hunt in! You can go hunting with up to 4 players over Wi-Fi. When you run into a quest that’s just too much for you to handle by yourself, call on your friends to join the hunt! *Online (co-op) play is not supported over mobile data connections such as 3G. *To get the best co-op gameplay experience, make sure you have a strong Wi-Fi connection. *You must be signed in to Game Center to play online (co-op). Use the MFi Game Controller to get the best hunting experience! *The MFi Game Controller is not compatible with iPhone 4s or iPad (3rd Gen). This entry was posted and tagged 2-player co-op, 3-player co-op, 4-player co-op, Gamecenter, iOS Universal, iPad, iPhone, new releases, wi-fi on July 28, 2014 by admin. New friendly multiplayer level in which co-operating with your friends is recommended! Fly and survive through the award-winning action adventure BADLAND. More than 10 MILLION players and counting! #1 GAME in 83 countries! BADLAND is an award-winning atmospheric sidescrolling action adventure platformer taking place in a gorgeous forest full of various inhabitants, trees and flowers. Although the forest looks like it’s from some beautiful fairytale, there seems to be something terribly wrong. The player controls one of the forest’s inhabitants to discover what’s going on. Through his journey he discovers astonishing amount of imaginative traps and obstacles. This entry was posted and tagged 2-player co-op, 3-player co-op, 4-player co-op, co-op added in update, Gamecenter, iOS Universal, MFi Controller Compatible on February 23, 2014 by admin. Are you ready to experience the most challenging action horror shooter in the App Store? Features the first ever full multiplayer co-op campaign for the iPad, iPhone, and iPod touch. Fight zombies and epic bosses with your friends through post-apocalyptic environments. The year is 2013 and the world as we know it has come to an end. Society has completely broken down. The Scourge as it has become known is an engineered virus stolen and then released upon the world by Al-Qaeda. It was intended to send the West back to the Stone Age by turning their citizens into crazed mutated beasts. In this power, vacuum Al-Qaeda planned to create a new world order. The infected roam the world and outnumber the few left alive. Pockets of civilization hole up around the planet trying to survive and weather the storm. Courageous and highly-trained groups of mercenaries explore the deadly ruins of civilization to salvage critical supplies and provide defense for these settlements. Their future is in your hands, Mercenary. 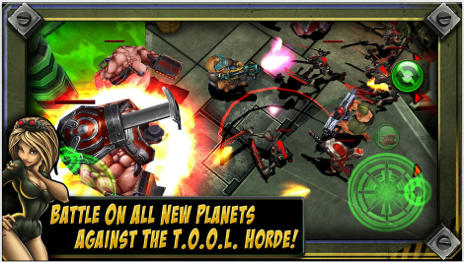 One of the greatest features included in 2013: Infected Wars is the option to play with your friends throughout the entire co-op campaign – something never before seen in the App Store. Every part of the game is designed to be played in both single player and co-op. As you progress deeper into the red zones missions become increasingly challenging, requiring wits and tactical skill to survive! This entry was posted and tagged action game, Gamecenter, iOS Universal, iPad, iPhone, new releases on September 6, 2013 by admin. Welcome to Junk Jack X! It is a 2D sandbox where you can explore, build and survive in randomly generated procedural worlds, full of monsters, hidden treasures and beautiful landscapes, now even in multiplayer with friends! This is not a freemium game, buy it once and enjoy the full game experience! – a fully featured equip system with more than 390 different wearable items to enhance your adventures or just to make your friends envy! – liquids to enhance or impede your explorations: avoid dangerous lava or go for a swim in a surface lake! – character customization, you can play also as a female! This entry was posted and tagged 2-player co-op, 3-player co-op, 4-player co-op, Gamecenter, iOS Universal, iPad, iPhone, new releases on August 29, 2013 by admin. The battle for Northern Udar rages on! It’s been 100 years since the First Demon War tore the land apart. Thanks to the Eternity Warriors the demon threat was held at bay. However the demons have been consolidating their power in a series of Demon Towers built in locations throughout Northern Udar. THE ULTIMATE DUNGEON CRAWLING ACTION GAME HITS YOUR iPhone & iPad! REAL TIME PVP AND CO-OP MULTIPLAYER! Battle against or alongside fellow warriors in ONLINE MULTIPLAYER MODES! Face off against dozens of NEW demon enemies! Battle with a fellow warrior in the ONLINE MULTIPLAYER MODE! Slice your way through MULTIPLE UNIQUE DUNGEONS! COLLECT ARMOR, WEAPONS AND LOOT! Upgrade your gear to become the ultimate Eternity Warrior in Udar! Eternity Warriors 2 is free to play, but you can choose to pay real money for some extra items, which will charge your iTunes account. You can disable in-app purchasing by adjusting your device settings. This entry was posted and tagged Gamecenter, new releases on August 18, 2013 by admin. Currently the #12 bestselling paid app on the App Store, Block Fortress now has co-op multiplayer! Build your fortress, and defend it to the end! Block Fortress gives you the freedom to create a stronghold in almost any way you can imagine, and then puts you in the middle of the action trying to defend it from the relentless attacks of the menacing Goblocks! Put your skills as both a builder and a fighter to the test as you try to survive as long as you can! • added GameCenter co-op multiplayer with support for up to 4 players! This entry was posted and tagged 4-player co-op, Gamecenter, iOS Universal, iPad, iPhone, new releases on July 18, 2013 by admin. Optimized for the iPhone 5 and iPad 3rd Gen & 4th Gen. Gun Bros 2 does not support the iPhone 3GS, iPod Touch (4th generation) or iPad 1. Untold years after the first T.O.O.L. wars, the Tyrannical Oppressors Of Life have returned to finish the job. Only the Freakishly Rugged Advanced Genetics Galactic Enforcement Division (F.R.A.G.G.E.D) agents Percy and Francis Gun stand in their way. Armed with a new array of highly advanced and ridiculously destructive weapons, the Gun Bros are once again defending the galaxy from the T.O.O.L. insurgency. It is a time to innovate and eradicate. The last conflict has left both sides scrambling to rebuild their armories. Old Xplodium mines have been reopened and even decommissioned factories are once again roaring to life as the conflict escalates. It is up to Percy and Francis to stop this threat from reemerging with an even more devastating arsenal of killing machines. The Gun Bros are back and, once again, responsible for defending the galaxy. Luckily, they’ve got access to a host of new gear that will help them defeat T.O.O.L. Battle the T.O.O.L hordes with your Gamecenter friends, head over to the all-new Endless Mode and check it out! Choose from a broad range of weapons; from pistols & rocket launchers to new and improved laser weapons & shotguns. Collect MODS and strap them on your weapon to gain secondary, tertiary and even quaternary fire modes! Players can even unleash multiple MODS at once! Invite your bros to join your tour of duty with an improved Brotherhood system. Share the fun! Share the love! Share the destruction! Advance through each mission, unlocking new environments and better loot in the Campaign mode or work your way to the top of the leaderboards in the Arcade mode! Every mission contains armor, but it’s up to you to find it and grab it. Increase your HP and SPD with bold new styles conceived by the galaxy’s top fashion designers and military experts, many of whom are the same person. Gun Bros 2 is free to play, but you can choose to pay real money for some extra items, which will charge your iTunes account. You can disable in-app purchasing by adjusting your device settings. This entry was posted and tagged Gamecenter, iOS Universal, new releases on February 25, 2013 by admin. The Undead Horde and their Orc and Goblin allies are at your castle gates, the King is on the brink of death, and only you stand between the enemy and complete annihilation! Choose one of 3 powerful heroes, summon an army to fight beside you, and defend your castle in Heroes & Castles, a seamless blend of 3rd person Action-RPG, Strategy, and Castle Defense elements! Team up with a random ally or one of your friends and compete in the GameCenter leader boards! This entry was posted and tagged 2-player co-op, Gamecenter, iOS Universal, iPad, iPhone, new releases on February 3, 2013 by admin. Currently #1 on the iPad Free Apps list and #2 on the iPhone Free Apps list, The Blockheads is a 2D simulated world sandbox game. Navigate huge simulated worlds thousands of blocks wide with a full temperature and climate system, seasons, an equator, and frozen poles. Explore complex cave systems and flowing water, and survive deserts and snowy mountain tops. Play alone, or with a friend, with online two player multiplayer and voice chat over Game Center. View some teaser videos of The Blockheads gameplay on the game maker’s Youtube channel. This entry was posted and tagged 2-player co-op, Gamecenter, iOS Universal, iPad, iPhone, new releases on January 13, 2013 by admin. Zombieville USA 2 - Mika Mobile, Inc.